As I've mentioned already, one of the best ways to save on just about anything is to time your purchases so you're not captive to salespeople who can almost smell your desperation and capitalize on it. One such particular seasonal item, which by being prepared can save you lots of money, is the Purim costume. Or, if you have several kids, make that costumes. When I was a kid, your average Purim costume meant you slapped on some of your mother's makeup, wore the long gown said mother bought you for some relative's wedding, and passed your getup off as Queen Esther. Unfortunately, nowadays, that won't work on any child old enough to go to gan. Some costumes, especially if your child has his or her heart set upon being a Disney or other merchandised character for Purim, can set you back over NIS 100 - which in my book, is kind of steep for an outfit to be worn for 2-3 days max (wedding attire excepted, of course). If you have more than one child, and especially, the older the children get, the expenses increase accordingly. Make your own. But wait a minute, didn't I just say "even if you can't sew"? For one thing, while you might be able to get fabric scraps at the store and save lots if you are the crafty, sewing type, there's no guarantee you'll find the scraps you want at the fabric store, and buying more than a meter or two of fabric might not save you that much money, But if you do, and you can sew, more power to you (and boy, am I envious!). If you're not the sewing type, there are plenty of great ideas for no-sew costumes on the Web - see examples such as these , this slide show or this Pinterest board . If you or your child have a specific costume in mind, say a turtle, try Googling "No sew turtle kids costume" and see what pops up . Also keep in mind that for the purpose of Purim, a glue gun can be an acceptable substitute for thread and needle. Fashion a costume out of accessories. 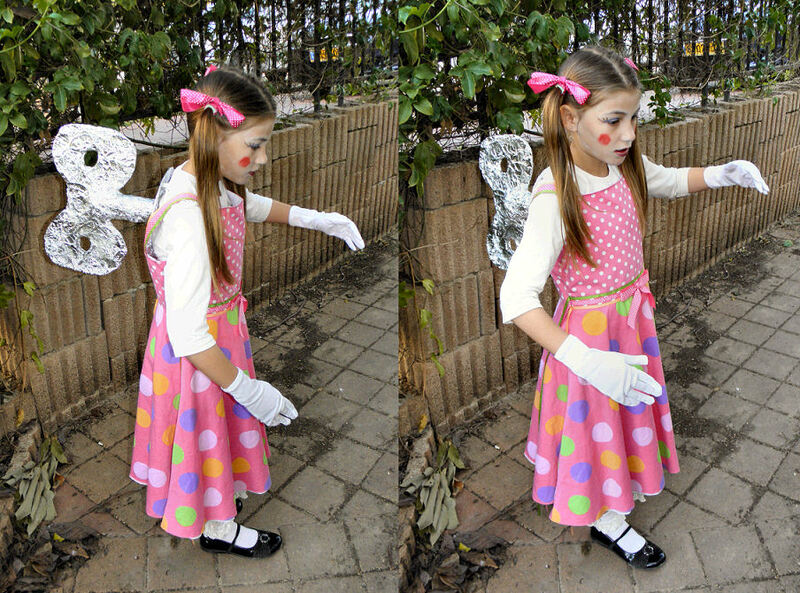 Instead of buying a full-body costume, some types of costumes lend themselves to dressing the kids in clothing they own or can borrow, and just adding accessories, which are generally cheaper. For example, a cowboy can dress in a button-down plaid shirt (either his own or borrowed), blue jeans, vest, and a paisley bandana from Mommy, and you can buy a cowboy hat, holster and toy gun to complete the look. A fairy can dress in her prettiest lacy dress, be made up with Mommy's makeup, and add a store-bought sparkly wand and headband with antennae (you can also buy wings or make them, as in this Youtube video). Hold a costume swap. Got good-quality, good-condition costumes from previous years? Are others in your immediate area, perhaps, in a similar predicament? Hold a costume swap several weeks before Purim. There are quite a few community centers and synagogues which have such a swap each year, or you can initiate one yourself. Get it secondhand. Either at your local thrift shop (I know I've donated and bought costumes from such shops over the years, I can hardly be the only one), or online at yad2 , a variety of Facebook groups, such as the Anglo-friendly Buy, sell, swap (Israel), or even free at Agora . Keep in mind (in the case the item isn't free) that in some cases you can negotiate the price. Also, if the costume is still in good condition after Purim, you can resell it and get some or all of your money back the next year. Buy it online. One of the nicer things about being Jewish is that we don't have to participate in the Halloween rush for costumes along with all the Americans, who make up the bulk of online buyers. Hence, after Halloween is over, there are plenty of (relatively) discounted costumes to be had, on large online marketplaces such as eBay and Aliexpress. This is a good option if your child wants a merchandised character (e.g., Ninja turtles, Anna or Elsa from Frozen). I would avoid specialized American or British online costume retailers, as their prices are very expensive and shipping even more so. And their stuff is mostly made in China anyway, so just cut out the middleman. As many of the costumes with decent prices and cheap/free shipping options are sent from China, keep to the guidelines I listed here and make sure to order your costumes at least a month and a half in advance (2 months if you really want to make sure they get here on time). Also keep in mind that the Chinese new year occurs in early February, and many sellers take off around then, so do your best to order before then. For a further rebate on your purchases, don't forget to pass through the Israeli cashback site (more on this highly recommended site here ). Here's hoping your kids love their costumes and you have a happy Purim!